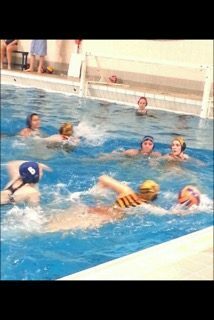 If you follow Reset Sports Massage on Facebook or Instagram, you may know that I enjoy playing waterpolo. I currently train and swim in Witney and Banbury. My friend, Lewis, coaches The University of Stirling Ladies’ team. He recently got in touch to ask me to put together a video showing some “prehab” resistance band exercises for his team to use during their warm up. You can see these below. The exercises are specifically chosen because they benefit shoulder stability, thoracic rotation, and glute strength, which are important in swimming and water polo. However, they are also good exercises to use during other throwing sports, or weightlifting warm ups, and would benefit every day strength, stability, and posture. *Always consult a qualified medical professional before beginning any exercise program. Reset Sports Massage can accept no liability for personal injury related to these exercises. Lift tall through the crown of your head and engage the core by pulling the belly button back to the spine. Exhale to pull the band apart. Keep the shoulders back and down. Keep the shoulder down away from the ear. Lift the elbow towards the ceiling but try not to flare the upper ribs out. Keep good core engagement as if somebody is about to punch you in the stomach throughout the exercise. Keep your wrist strong and solid. Keep your thumb up to the ceiling during this exercise. Keep your eye gaze to the floor to protect the neck. Don’t allow the lower back to dip. Only left the leg to parallel to the body or below to avoid this. Keep eye gaze down to the mat to protect the neck. Trains shoulder stability and scapular control. Develops good biomechanics of the shoulder complex by working scapular upward rotation against resistance. Bend your knees with your heels towards your bottom to ensure a neutral spine. Keep good core engagement to stop the upper ribs flaring towards the ceiling as the arms move above shoulder level. Warms up the hip and knee joints. Strengthens the gluteus maximus muscle. Brace the lower abdominals to ensure that the lower back remains pressed to the floor. Focus your mind on your glutes (buttocks) and try to start the movement there rather than with the hamstrings or lower back.